You can end your TripIt for Teams subscription at anytime and keep your subscription benefits for the full term paid. Canceling your TripIt for Teams subscription will prevent auto-renewal of your TripIt for Teams membership but allow you to keep all benefits for the full term of your subscription. If you are in a trial period canceling your subscription will prevent a charge to your credit card if you cancel prior to the end of the 30th day of the trial. If you are looking to close your TripIt account you must first cancel your TripIt for Teams subscription. Click the arrow next to your user name and select Settings. On the left side of the page, click Billing Info. 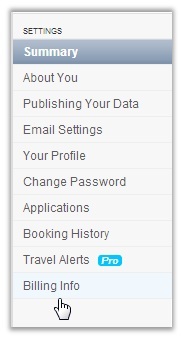 Click on the Cancel TripIt for Teams button.